I’m giving this movie four and a half bats out of five. I saw ‘Batman Begins’ at the 12:01am Atlanta premiere with a theater full of fans, which always tends to make an action-adventure movie more fun to watch although it does make it harder to see the screen when there are 200 little Bat-Ears poking up from everyone’s costumes. This week I attended a special screening of the film ‘Serenity’, the third such pre-release audience test screening to visit Atlanta in the last eight weeks. Based on the failed FOX network series ‘Firefly’, this movie represents a Very Big Thing to the world of science fiction fandom; one of the very few times that a cancelled television show is moved up to the silver screen with creator, cast and crew intact (think: Star Trek). Before the movie began there was a brief, pre-recorded introduction by the show’s creator/director, Joss Whedon (aka Joyce Wilber, aka Jox Wheaty, aka Jake Wheelbarrow and any other other intentional mispronunciation I could think of to elicit wails of frustration from the man’s fans). It was Thursday, May 19th in the wee hours of the morning and I was driving home from the Regal 24, sleep already burning its way into my eyes when I sensed it. 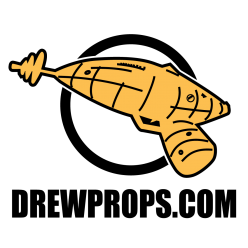 “What’s wrong Drewprops?” I spoke into the rushing wind from an open window. Towel-less went I into the great gaping maw of the 12:01am Atlanta premiere of HHGG, anticipation mixing with excitement, stirring itself into soda mixed with peanut M+M’s, bubbling over into a growing expectation that the movie might actually be good, raining down into a puddle of foreboding that the movie was all too soon going to dash my heart upon the sharp and familiar rocks of cinematic best-intentions-gone-horribly-astray. Something even more terrible than my opening sentence. It’s a lot of fun when a foreign language film breaks out of the art film circuit and into mainstream American culture, which will easily be the case with this movie. The subtitles were quickly digested by the audience, made all the more palatable with the zesty sprinkles of Warner Brothers “cartoon violence” (boy does that term steam my goat (no, I don’t know what that means either)). Still, ‘Sahara’ is a lot of fun to watch, delivering a great no-brainer action movie that would serve to spin Matthew McConaughey into a recurring role if the box office spikes on this preposterous, pre-blockbuster season release. Pixar, start counting your days – another animation team has finally figured out what your secret is: a good story. While its plot is hardly new, ‘Robots’ succeeds with a darned fine synthesis of Pixar’s “secret sauce”: imagination and heart. Blue Sky Studios has another winner on their hands from the same directing team of Carlos Saldanha and Chris Wedge who did the popular animated film “Ice Age”. Ugly, brusque and heartless is the new black, or the new Matrix if we’re talking about Keanu Reeves’ latest role as the anti-hero of the new Warner Brothers comic-turned-movie “Constantine”. Based on a character seen most recently in a comic series called “Hellblazer”, the movie follows the dark mission of one John Constantine; a human fighting a solitary war against both the forces of Good and Evil, each of which attempt to influence the course of human events with subtle nudges. The script plays fast and loose with Judeo-Christian motifs and fearlessly makes up things when history can’t supply the necessary components. Tax season unavoidably casts its wicked light into the darkened corners of my fiscal world, stirring a strange feral hatred of paperwork and an even stranger desire to sit in the living room surrounded by mounds of folders, picking through the remains of the past year, trying to assess my successes and failures. Pasting up a year’s worth of receipts, feature film petty cash style, is a daunting task. Actually figuring out what some of those receipts are is even harder.